We’ve turned a hand cream into a solid bar, to help dry, cracked, overworked hands. We start this product by making a decoction of water, sago and safflower petals to repair and calm the skin. Then to this we add an array of moisturising ingredients; cocoa butter, fairtrade shea butter, argan oil and aloe vera extract. Everyone wants soft hands, but no one wants shiny, slippery hands – so we have added talc to this bar to give a matte finish so that you are not left feeling greasy. Or to put it another way, for tiny hands, not shiny hands. Finished with a wonderfully light floral fragrance of chamomile, marigold and lime flower oils. As this is a solid bar, it needs no preservatives - kinder on your hands and safer on broken skin. The shea butter in this product comes from the Ojoba Collective. A women’s cooperative in Ghana providing empowerment, fair work and fair pay to over 400 women. They have very soft and lovely skin too! I bought this solid hand moisturiser bar as I thought it would be a great way of taking some hand food with me on the plane as it wasn't liquid. I thought this was quite good value as it weighs 340g and cost me £3.95. It is smaller than the usual massage bars but quite a lot bigger than the face serum bars which are only 20g and quite tiny. This little hand shaped bar was created by Lush for popping into your handbag so you always have something to feed your hands with where ever you are. Because it is a solid bar it won't spill although beware if we do ever get any hot weather as these do start to melt a bit when the temperature rises. They recommend using this as a moisturiser or under one of Lush's fresh face masks to boost the benefits of the masks. You have to hold the little bar between the palms of your hands until it begins to melt then gently massage this lemony smelling cocoa buttery cream into your hands and then around your wrists and is you want to take some up your arms too as it really feels like it is feeding your skin with goodness and smells divine. This can be used by itself as it is full of skin softening goodies such as cocoa butter, Almond Oil and lots of other really lovely ingredients. glycerine which is in lots of hand creams for its softening qualities. Initially I thought it would be a bit greasy but I found that it was quickly absorbed into my hands and left them smelling a creamy lemony fresh smell which lasted until I washed my hands again. WHAT IS IN THIS LITTLE HAND ? Stearic Acid: - is a fatty acid and emollient and is used in this case to help make the bar more solid as well as providing more oiliness for moisture. Linseed Mucilage: - Sounds disgusting doesn't it but linseed oil is good at making the skin smooth, soft and velvety. Also helps with skin conditions in people who lack of the Omega-3s in their diet as this is rich in Omega-3. Almond oil:- friendly to sensitive skin as it is naturally hypo-allergenic and has a mild scent. Almond oil has oleic and linoleic essential fatty acids which are easily absorbed into the skin and help the skin absorb the high content of Vitamins E and F in almond oil. It is a great emollient which is good at healing skin irritations like dryness and itchiness. Almond oil is also good at boosting immunity boosting as the anti-hepatotoxic properties help protect the skin. I just love almond oil and use it when I do aromatherapy massages as it is so gentle and good for skin. Chamomile water:- Chamomile is known for its calming and healing qualities. In my view it smells a little odd but I couldn't detect the smell in my bar luckily. Limonene: - is found in the essential oils of citrus fruits and many other plant species and has a pleasant orange scent. Linalool: here once again for its scent and has been called the 'sweetness' of many oils the most usual of which is though it is found in many species of plants. Once again some studies have found it helps reduce cancer cells. This is interesting and I do hope that it is the case. However we still have Methylparaben, Propylparaben both of which are questionable to say the least and if you are concerned I suggest you, look these up. Many people are allergic to these ingredients and if you have a potential for eczema then be aware this could worsen it. Yes I loved it. It smells creamy, sweet and lemony. The predominant smell is creamy buttery lemon in my opinion. It is a bit like a lemon tart filling but much milder. A wonderful idea Lush, one of the good ones that is useful and unusual. I took this to America with me and my daughter used it too and also liked it. I have read some reviews on the Lush website to say they thought it smelled of sick but I can't smell that at all. It is quite oily so you don't need a lot but of course by warming it in your hands you don't waste any at all as it rub it straight it. Would I buy it again? Yes, it was perfect for travelling as it is safe take carry on the plane so no danger of it getting lost in the main luggage. A little goes a long way and I used it every time I washed my hands but I did have to be careful not to apply it just before driving as it took a while to soak in and could have made the steering wheel slippery. My hands felt nice and soft and appreciated the care. I did find that it sunk in more quickly, or less came off when it was cold than when it was hot. Once we were in Las Vegas I found it got too soft for me to carry it in my handbag without risking it melting over other things and I kept it in the fridge there. I am very impressed with this little handy bar full of skin feeding goodness. I hope Lush keep on making this as it is so convenient and it did last me the whole month we were away and I still have some left so I can't complain about it lasting. I think though that I won't bother taking one when we go to Rwanda and Madagascar as it will probably end up as an oily mess in my bag. If we have some hot weather then might be a good idea to keep it in the fridge as I found once it was very soft I used it far more quickly as it melted very speedily. 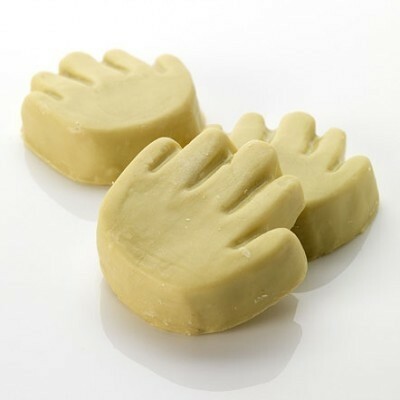 "I bought this solid hand moisturiser bar as I thought it would be a great way of taking some hand food with me on the..."